If you take smartphone technology out of its traditional “clever phone” context, it could change the world. While you were busy catapulting Angry Birds on your iPhone, scientists at Vanderbilt university were using the components inside your smartphone to create bionic limbs. The Vanderbilt leg, seven years in the making, anticipates the movements of the person wearing it, resulting in a more natural gait instead of the slight dragging experienced by most wearers. The trick is pulled off by loading the prosthetic up with batteries, powerful mobile processing, and a suite of motion sensors — many of the same core components that are jammed inside your precious, glossy smartphone. And it turns out that the advances achieved in smartphone tech, used cleverly, can change the world for people other than amputees too. 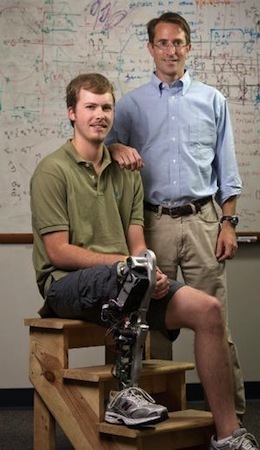 Vanderbilt’s leg is reportedly the first robotic artificial leg that has coordinated moves between the powered knee and ankle joints. A passive prosthesis lags behind the patient’s healthy leg because they have to wait for a body shift in order to move, but the Vanderbilt leg is built with sensitive motion sensors that help it understand the body position of the patient and how they’re moving. Its on-board computer uses this information to make informed guesses about which way they’re moving, and then move its own joints automatically. It can even detect a stumble, and lift up the robot limb to clear a trip-hazard obstacle. The upshots are a much more natural gait, and speedier and less energy-hungry travel than using a passive leg. This version of the Vanderbilt limb wouldn’t have been possible without recent explosive innovations in a number of fields. First is its battery life: It can run for about three days of normal use or 14 kilometers of continuous walking on one charge. Without the advances in rechargeable battery tech being pushed by smartphones and mobile computers, this kind of performance would’ve been unlikely. It’s also packed with precision micro-machined sensors to give it a sense of where it’s positioned, and how the body of the patient is moving. This is the same kind of high-tech engineering that makes your smartphone work as a games machine or augmented reality interface. The price of these sensors has been tumbling as companies like Apple and Samsung order them by the hundreds of millions–before around 2006 they’d been more or less exclusively developed for the car industry, but they’re now evolving into a multi-billion dollar industry all their own. The motherboard of the Vanderbilt leg has undergone 15 revisions to get it to its current advanced state, and it carries some significant processing power to get its job done. Precisely this sort of optimized mobile computing problem has faced smartphone makers, and they’ve optimized the use of power control and space-fitting technology as well as the explosion in power-sipping. 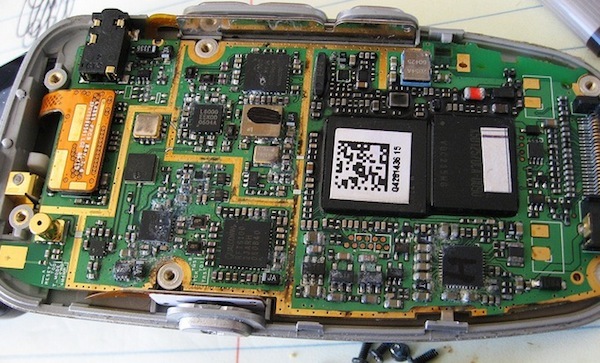 The powerful mobile CPUs from Qualcomm and ARM result in, for example, the amazingly compact board in the iPhone 4. The exploding market in smartphones and tablets has arguably pushed the development of these processors massively, to the point that in a few years with chips like ARM’s multi-core A15 design, they’ll be more powerful than even today’s desktop machines. But as amazing as the Vanderbilt leg is, there’s a much bigger and brighter future for smartphone tech to change the world. Consider, for one example, the push to develop a bionic eye. It’s only in the smartphone world that tiny space requirements have led to, for example, 12 megapixel cameras with advanced autofocus powers that are barely a handful of millimeters deep–exactly the kind of space constraints that would affect an artificial eyeball. Then there’s fast, efficient mobile networking technology–the kind that lets your smartphone hop onto a 3G connection and share it over a local Wi-Fi loop, or even Bluetooth, with nearby computers. It’s this kind of clever, power-friendly, mobile tech that’s enabling such advances as smart, wireless-controlled insulin pumps for diabetics. As we develop more and more artificial limbs and organs, its surely via wireless connections like this that users will stay informed about the state of their prostheses–possibly even tweaking their performance–and doctors will interface with them via computers during checkups. Necessity is the mother of invention, and war has been perhaps its grandmother (driving necessity for military needs). But is it time to think of the smartphone as at least the little, geeky aunty of invention? The quirky one who makes you try new things, and teaches you all sorts of exciting new stuff?